For today's version, I had some great sponsor products to work with. I cut boneless, skinless chicken breast into strips and then dusted them with Adam's Burgers Fries & More seasoning. I rubbed the grates down with olive oil, and then heated it to high on one side. I added the chicken and turned it down to medium. I cooked the chicken until it was no longer pink and the juices ran clear. While it was cooking, I tossed the beautiful Michigan Asparaus spears with a little olive oil and heated the other side of the grill to medium high. I grilled them until they were soft and the tips were a little bit crunchy, just how I like them! Once both were done, I cut them into bite sized pieces and set them aside. I cranked up the heat on both sides of the grill to high, cleaned it with a grill brush, and then oiled the grates. My dough was warmed up and very pliable. Rather than dusting my hands with flour to keep it from sticking, I used a teaspoon of olive oil. I divided the dough into 2 parts, and stretched each into a freeform shape, carefully laying each piece down on the grill. I turned the heat down to medium, and grilled the first side, rotating it once, until it was golden brown. The time will really depend on how thin you've stretched the dough. Once the first side is cooked, flip it over and apply your toppings. I used Not Ketchup's Tangerine Hatch Chile as the sauce base, sprinkled it with some shredded mozzarella, then topped it with the grilled chicken and asparagus. Close the lid and cook until the bottom crust is browned and crispy, and the cheese is melted. Again, this will vary based on how thick your dough was and how high you've piled the toppings. Move to a cutting board, slice and enjoy! I loved how all of the flavors worked together. Each component was great on it's own, but together, wow! 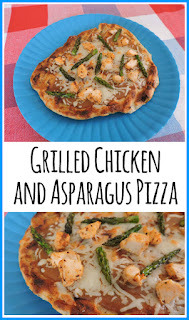 Beautiful crispy dough that was chewy on the inside, a sweet and spicy citrus sauce, along with the freshnessness of the asparagus and perfectly seasoned chicken. It's one of my favorite meals to come off my grill, and I definitely will be making it again! Thank you so much to Ellen from Family Around the Table for hosting #BBQWeek and to all the other #FestiveFoodies for sharing their recipes. I'm so excited to see what everyone else is making. Huge thanks also to our sponsors, Not Ketchup, Michigan Asparagus and Adams Extracts for their very generous gifts to us and for the #giveaway, be sure to enter for your chance to win one of the prize packs below! 1lb boneless skinless chicken breast, cut in strips. Heat grill to high and make sure that it is very, very clean. Lightly oil grates. Season chicken with Adam's Burgers Fries & More to taste. Place it on the grill and reduce heat to medium. Cook until no longer pink and juices run clear, approximately 5 to 8 minutes. While the chicken is cooking, toss the Michigan asparagus with oil, and place it on the grill. Turn and cook until the spears are soft, and the tips are a little bit crunchy. Remove chicken and asparagus when done and cut them into bite sized pieces, set aside. Heat the grill to high, and clean it to prevent the dough from sticking, and oil the grates again. Rub a drizzle of olive oil onto your hands to make the dough easier to work with. Divide the dough in half and stretch it gently into whatever shape you like. Lightly place it on the grill. Reduce heat to medium. Cook until golden brown on one side, rotating it as necessary. Flip the dough over, top with Not Ketchup Tangerine Hatch Chile sauce, cheese, chicken and aparagus. Close the lid and cook until the bottom of the crust is golden brown and the cheese is melted on top. Remove to cutting board, slice and enjoy! 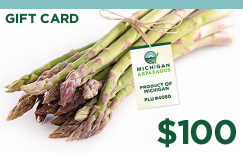 Prize Number 1: $100 Gift Card Courtesy of Michigan Asparagus (Value $100) Michigan Asparagus is known for its hand snapped fresh asparagus. It is available May – June and grown mostly in Oceana County along the shores of Lake Michigan. 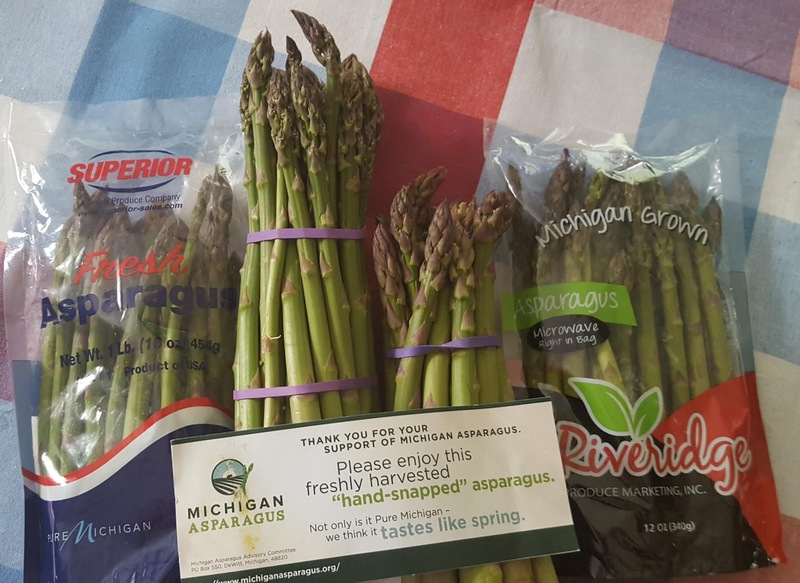 Michigan Asparagus has excellent flavor and a long shelf life. It is a nutrient-dense, low-calorie vegetable with no fat, no cholesterol, and very little sodium. Approximately 120 local Michigan farmers produce approximately 20 million pounds of Michigan Asparagus during the state's 6-7 week harvest. Remember to buy U.S. for the freshest of the fresh. Prize Number 3: A bottle of vanilla and a selection of rubs from Adams Extract & Flavors (Value $30) Adams Extract From humble beginnings in Battle Creek, Michigan, to a rooted history in Texas, one thing has stayed the same: a commitment and passion to provide only the highest quality and innovative products and services. For over 125 years it’s really been that simple...make great food taste even better! 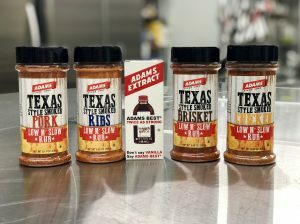 Today, Adams proudly manufactures and markets under several Adams Brand banners, including Adams Best®, Adams Extract®, Adams® Seasoning & Spice, Adams Reserve®, Flavor King™, Pantry Basics™, Sear-n-Crust®, ClearVan™, Carniceria®, Cocina del Rey®, Naturals™, and Urban Canner™ along with the Adams Frozen Skillet Desserts and Adams Premium Ice Cream lines. Yum! This is my kind of pizza!!! They're really good and fun to make too! Love everything about this grilled pizza - so healthy and delicious!! YUM! Pizza is the one thing I refused to give up when I started eating healthier. I just had to find new ways to enjoy it! OK, you've convinced me. I need to grill pizza. This looks amazing and I bet the Not Ketchup sauce was a wonderful addition. It was just the right base! I can't wait to try more varieties, I've got my eye on the Blueberry White Pepper next. This looks great! I really need to try grilling pizza. It's really fun, and easy. I started out using the premade crusts like Boboli, then graduated to dough. Grilled pizza is the best, Jolene, isn't it?!? Thanks for inspiring me to grill pizza and use Not Ketchup on it. Genius. So many ways you can use the Not Ketchup, I'm excited to try more! What a great pizza idea for spring! Delicious, and filling, but not heavy! I can't wait to make it again. This looks delicious. Loved grilled pizza! I just made a shaved asparagus pizza and loved it. Shaving the asparagus is a great idea! 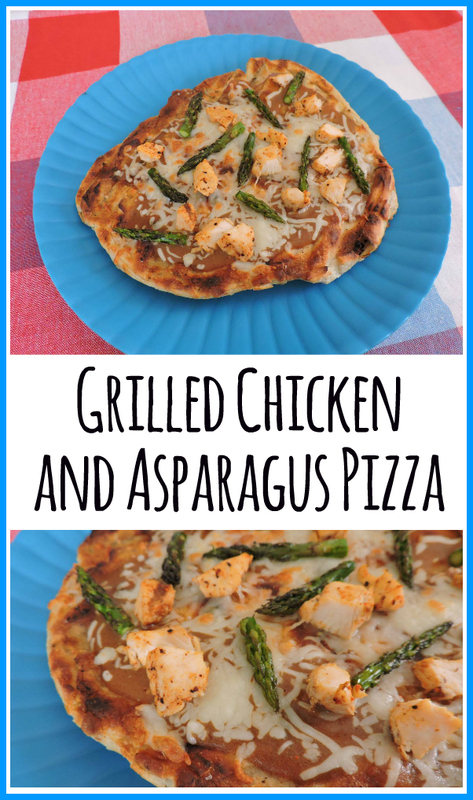 Love a grilled pizza and this combination is perfect! A fantastic grilled pizza! Love grilling pizza and you are using awesome summer flavors. I love the bit of char on the crust. This would disappear in a nanosecond here! Love that you used the BBQ sauce as a pizza sauce. I have a bottle of that in my fridge right now, begging to be made into this pizza! We love to make pizza on the grill. Iove that you used Not Ketchup for the sauce! What a flavorful looking pizza and I love that you did it right on the grill!